Well as some of you know I have been having a horrible experience with my current phone company H2O Wireless. I have spent countless hours with them on the phone, so I have been traveling around trying to find another alternative to my current phone service. I spoke with one representative from H2O Wireless and they told me I would not receive a refund for my inability to text for these past weeks. The supervisor told me that H2O policy is not to issue credits or refunds. Anyways I traveled to the T-Mobile store this past weekend (love the new interior redesign by the way) and I checked out the phones while I was there. 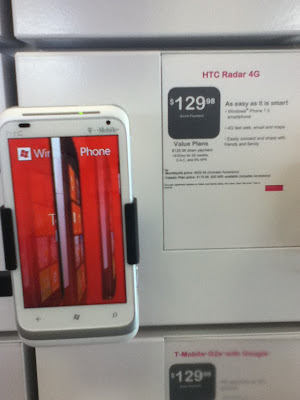 This was my first encounter with a Windows Phone 7 and I was actually impressed! I thought the UI was very clever and it was a slick looking device. HTC has always been a personal favorite of mine for phones and they did an outstanding job with this Windows phone. Since Windows Phone 7 is still an emerging mobile OS, I know the apps are lacking, but in due time they will increase to the same quantity as seen in the Marketplace and the App Store. I am surprised I liked this phone, particularly because I am strictly a Mac/ Ubuntu user. Check it out for yourself! Oh, and I have decided to go with the $30 a month plan with T-Mobile that includes 1500 minutes/texts and 30 megabytes of data. What do you all think? Is that enough? I’m trying to save money so I think it will suffice. ~ by branhow on January 16, 2012. The suite offers controls and capabilities that are currently not available in the UI Toolbox for Windows Phone and not even in the OS, such as Gauge, Window, Transition control & more.